The Daniel Montez Real Estate Group is proud to present and host a food drive this month along with our trusted partner American Title Service Agency. We have been collecting donations since the beginning of November, and all items donated will be provided to St. Mary’s Food Bank Alliance. We will be collecting the above items at our office located at 33 N. Lindsay Road Suite 111, Gilbert, AZ 85234 until December 3. 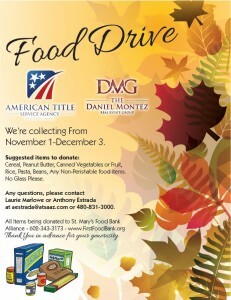 Should you have any questions about our Food Drive please do not hesitate to contact us! We thank you in advance for helping us feed the hungry in the Phoenix area.